One of the persons that contested for the throne of Obi of Onitsha, Chief Godwin Odukwe, has said that the leader of IPOB, and Director, Radio Biafra, Mr. Nnamdi Kanu personally put himself into the trouble he is currently going through, saying that he does not have the right to breach the norms and the unity of Nigeria. 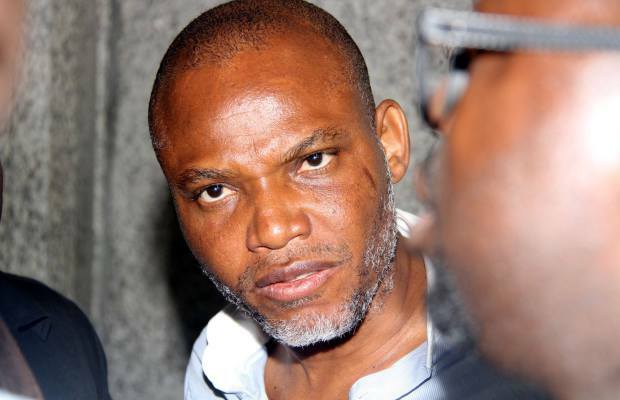 The Onitsha chief spoke as Nigerians continue to react to the continued incarceration of Kanu, despite the protests for his release, in South East and South South states by pro Biafra agitators. Speaking during the celebration of his 50 years of marriage, the Obi stool contestant, who is still pursuing his case for the stool in the court, said he felt very bad over the agitation for Biafra actualization. “I personally believe that Mr. Kanu personally got himself incarcerated, his coming back to Nigeria, the abusive words and speech by him through Radio Biafra was unnecessary and uncalled for, it amounts to fanning the embers of war. “I feel very bad over their agitation for a sovereign state of Biafra. Igbo suffered during the war, younger men who never knew what war looks like, are the people who have started talking about war by agitation for sovereign state of Biafra,” he said. Admitting that the South East zone was marginalized in all ramifications, he advised that dialogue and round-table discussion should be used, instead of being confrontational over the poor condition of the zone. Chief Odukwe stressed the need for the Igbo to be at the same level with other ethnic groups and states, adding that the infrastructure decay was a source of worry that prompted the agitation. “We have to be at par and on equal level with other parts of the federation. Look at the condition of South East roads, this country belongs to all of us, the money in this country belongs to all of us, and therefore, we should not be going through the marginalization we are seeing now,” he said. He thanked God for making it possible for him to attain the level of celebrating golden jubilee, adding that it was achieved through prayer, perseverance, love and hard work.